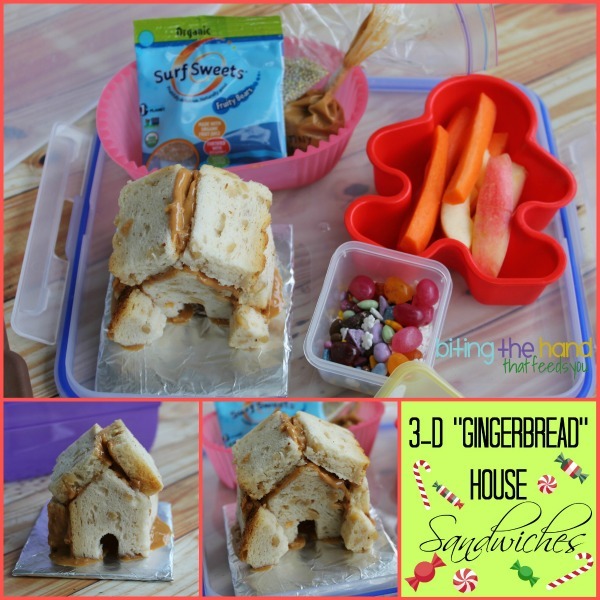 Biting The Hand That Feeds You: 3-D Gingerbread House Sandwich for Lunch! 3-D Gingerbread House Sandwich for Lunch! 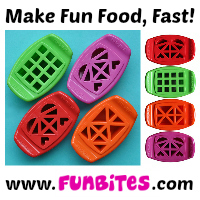 I found this mini gingerbread house cookie cutter and had to find a fun way to incorporate it into a lunch! So I made little sandwich "gingerbread" houses, stuck together with peanut butter. 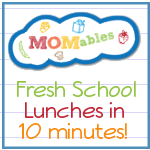 A perfect Christmas-y lunch for the last day of school before the holiday break! 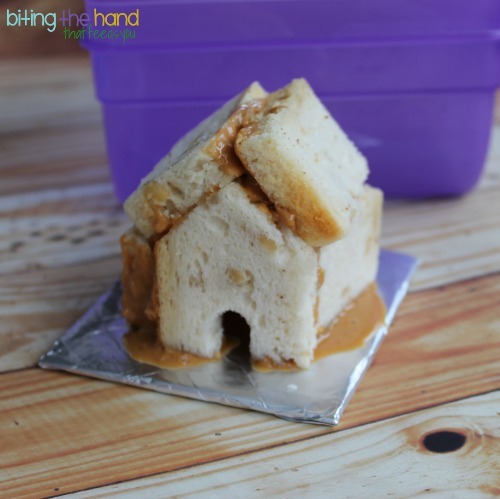 For my First Grader, I built this little bread and peanut butter house on a square of foil-wrapped cardboard, just like you would a regular gingerbread cookie house. I even added a few bread trees using some tiny tree cutters. I thought it would be fun for her to decorate her little house too, so I added a bunch of candy - way more sweets than I normally would include. 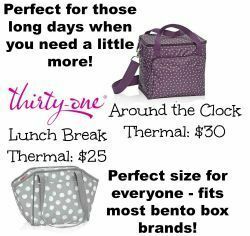 Last day of school before vacation though, so cause for a special treat! In addition to a packet of dye-free Sprinkelz, I sent a single-serve packet of dye-free Surf Sweets gummy bears, and a zip-close baggie with extra peanut butter for her to use as icing. I taped it to keep the PB near the corner, and used a Sharpie to mark where to cut it to turn it into a piping bag and a message to only make a tiny cut. 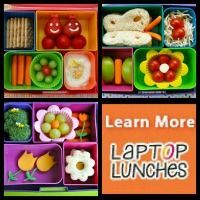 At her school they eat in the lunchroom, and she is allowed to access scissors to help open packages and such. I also packed an EasyLunchboxes Mini Dipper with some dye-free Choco-Rocks, candy-covered sunflower seeds, jelly beans, and India Tree Nature's Colors snowflake quins. 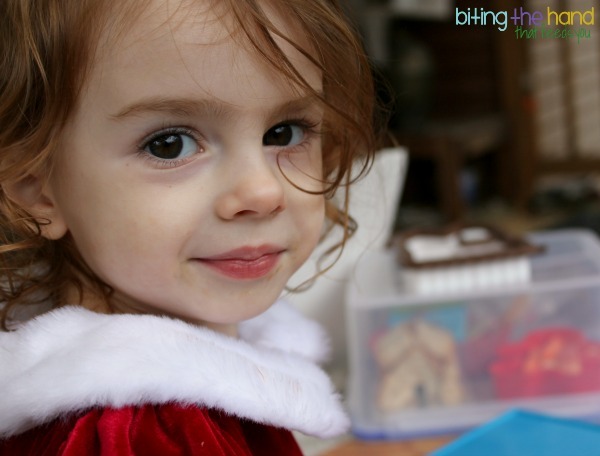 I didn't pack too many apple slices and baby carrots in the gingerbread man silicone cup because I knew she wouldn't eat much - she'd be too busy eating and decorating with the candy! The only lunch box deep enough to hold the assembled house sandwich that I own is a Yubo, but it is designed to be carried sideways. Plus I couldn't find all the parts to ours. Doh! So I used a large Snapware container and packed it upside-down so she wouldn't have to lift the house out of the box and risk dropping it or messing it up. Because everything was all loosey-goosey in there, I carried it in for her and put it in her cubby. That way she only had to be careful carrying it to the table at lunch. 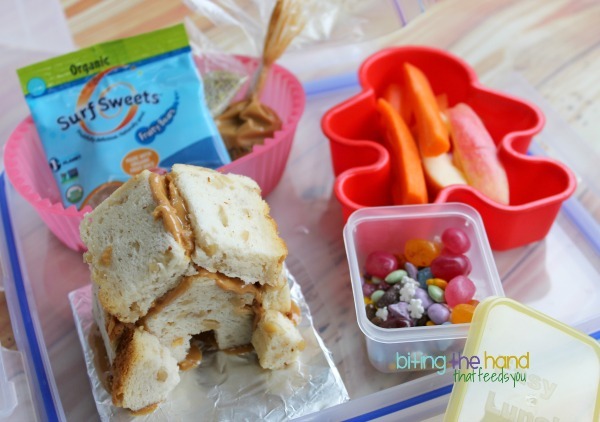 I packed these lunches the day before, and Little Sis saw me making a house for Big Sis. And wanted one! My first house looked terrible, since the roof wasn't fitting right when I built the house as pictured. So I stupidly tried making each side overlap one of the other sides, making the whole house lopsided and the roof crookedy. Doh! So I decided my toddler could have that one, and I made a better version for my older girl! 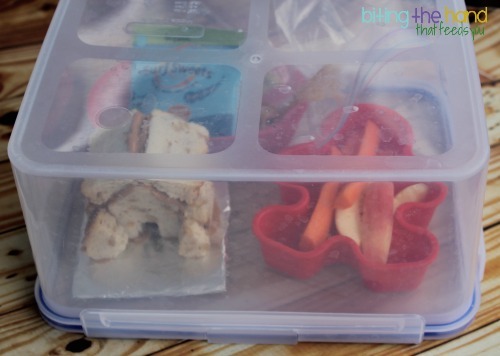 The next day, when I served up her lunch, instead of using her extra PB to decorate the house, E dipped her apples in it, and ate the candy separately! Hahaha!